First up is a nice picture of the back of the New York Public Library, Bryant Park and the ice skating rink they have this winter. It's been a few years since I ice skated - anyone want to go? 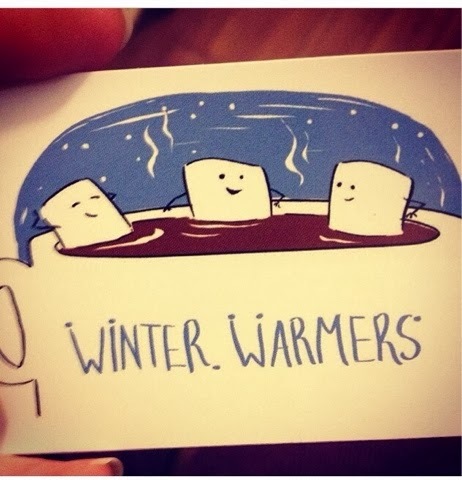 Last night I went to Winter Warmers, a S'mores and Hot Chocolate Cafe. I really wish I had thought to take s'more pictures while I was there, but I didn't. I would have captured the giant chalkboard and birch tree painted walls in the space. Since I forgot to take pictures of the place (and of the s'mores!) I just have these cute stickers to show for it. Although I expected a darker warm and cozy space for Winter Warmers, the s'mores creations made up for it. They have a selection of flavored marshmallows and toppings to put on top of homemade graham crackers. Mine was just about perfect and consisted of vanilla marshmallow with dark chocolate, butterscotch and dried blueberries on top of the homemade graham crackers. Also a big fan of these stickers that they had. Here is Peanut with Adam. We dog-sat him for a few days this week. I walked through this at Chelsea Market and thought it was really pretty - thousands of lights made for a nice picture.